The Kopa is a semi-custom gentlemens pocket knife conceived by Spyderco to add to its Clip-It range. With 17 variations initally slated for production, and each variation limited to 600 units and each with a different material for its inlay. The Kopa has often been described as a younger sibling to the clipless Kiwi. With its various inlays, limited production numbers, and being of a more diminutive size, the Kopa is a great collector's knife. The Kopa makes appearances only in Sprint Run catalogues or flyers as it is not a regular production model. 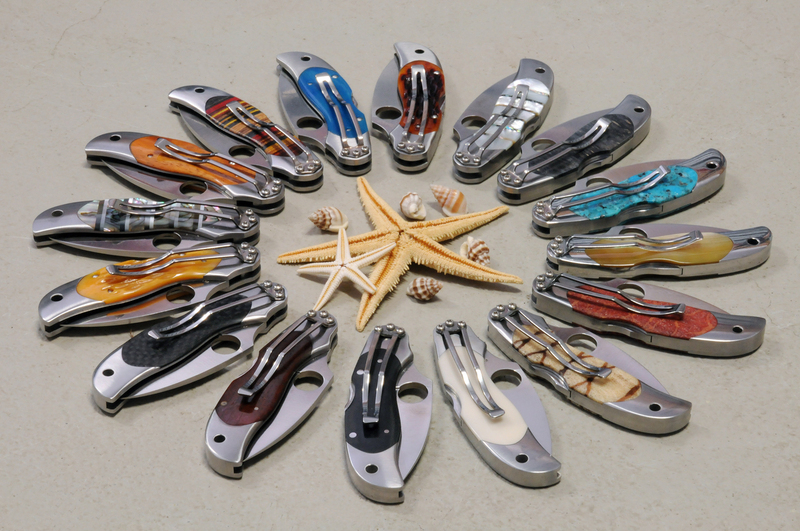 The following info has been tranposed from the Spyderco web catalog and is specifically from the page showing the Kopa Cocobolo - the first of the Kopa releases which made its debut in early 2005. "The Kopa CLIPIT is the newest model in Spyderco's canon collectible gentleman's folders. Two debuting models launch the coming series,which highlight stainless handles inlayed with exotic materials: The first is manufactured with Cocobolo wood,and the second with black linen Micarta insets. Quantities are limited to 600 pieces per handle material and new models are scheduled for release regularly throughout 2005. The Spyderco C92 Kopa is a Spyderco that has been made in several variations. All made in Seki City in Japan. When the Kopa line was conceived and slated for production as a sprint run of 600 per inlay variation, only 17 variations were scheduled to be produced. 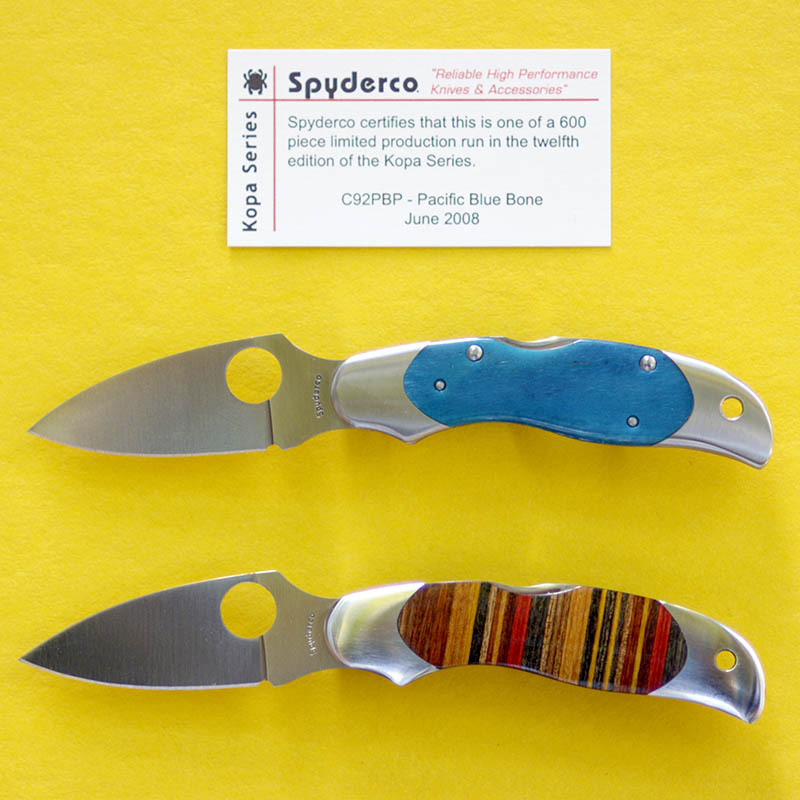 However, due to collectors demands on certain late models in 2008, Sal Glesser/ Spyderco had announced the possibility of investigating realeasing another 10 more variations - making the total Kopa variations amounting to 27 by the time the C92 model comes to a close. With between 3-4 variations produced each year, this could take production of the Kopa out to approximately the year 2013. Releases of the Kopa have been limited to around 3 to 4 per year to suit the production schedules of the Seki City factory. Being a sprint run, each Kopa variation has inherent rarity and collectible value. Each Kopa sprint run is limited by Spyderco to only 600 pieces. The most sought after variations of the Kopa would probably be the first 2 that were released - being the Cocobolo and the Black Micarta versions. This is only by virtue of their originally released status and not by material cost or rarity as later preceding models had much more expensive inlays and their MSRP were higher. Cocobolo and Black Micarata models were released almost simultaneously on the market in early 2005. Some private collectors have embellished their own Kopas by way of engraving of bolsters, scrimshawing and replacement of inlays with various other materials. These are of course customised work done by their respective owners and are rare by virtue of their customised nature. Is the Kopa the best gent's/ office knife ever conceived? Will there be a clipless Kopa released in the future? Will there be a Boye Dent-less Kopa in the future? Will there be a left handed Kopa in the future? Will there be a stainless steel Kopa or a Carbon Fibre Kopa in the future? Will there be a Boye Dent-less Kopa in the future? Probably not -Sal Glesser has slated the possibility of this, but the Kopa series has been completed as of this time. Will there be a left handed Kopa in the future? Probably not -Sal Glesser has slated the possibility of this, but the Kopa series has been completed as of this time. 5 13/16" 3 7/16" 1 15/16" 7/16" 1/8" 2.5 oz. This page was last modified on 11 October 2018, at 19:29.